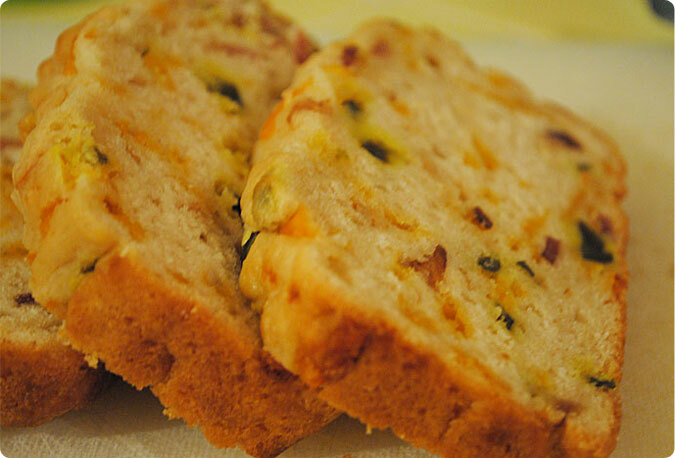 Oh, how I love quick breads. They are delicious, easy and, most importantly, quick. This month’s challenge was quite versatile and so fun. I was able to make one loaf of savory bread to serve with dinner and then a sweet loaf a couple days later for breakfast. Getting started on this challenge more than a day before the posting date was immensely helpful and I hope I can do the same thing next month. But we shall see…I have a history of acknowledging how great it was to work on something and get it done early and yet still managing to go back to my old ways of procrastination. This jalapeño bread was a big hit. I made a meal of barbecued chicken, creamed corn and cole slaw (all recipes I’d never used before and all of which were flops) and then this bread. My husband told me the bread was the best part of the meal, and he was right. I used a sharp cheddar cheese, pickled jalapeños, crumbled bacon and a bottle of Shiner. We ate it with dinner warm from the oven and the next couple of mornings toasted with butter. I’m bummed it’s all gone, so I’ll probably have to make another loaf. Preheat oven to 375°F and grease a 9×5 loaf pan. Measure and then sift the flour, baking powder, sugar and salt into a mixing bowl. Mix in the the chopped jalapeños, cheese and bacon. Pour one can of beer into the mixing bowl and mix until blended. Pour mixture into the loaf pan, then pour half of the melted butter over the top. Bake for 30 minutes, then pour remaining butter on top of the loaf. Bake for another 20-30 minutes or until golden brown. Cool for 5-10 minutes, then remove from the pan and cool an additional 10 minutes. 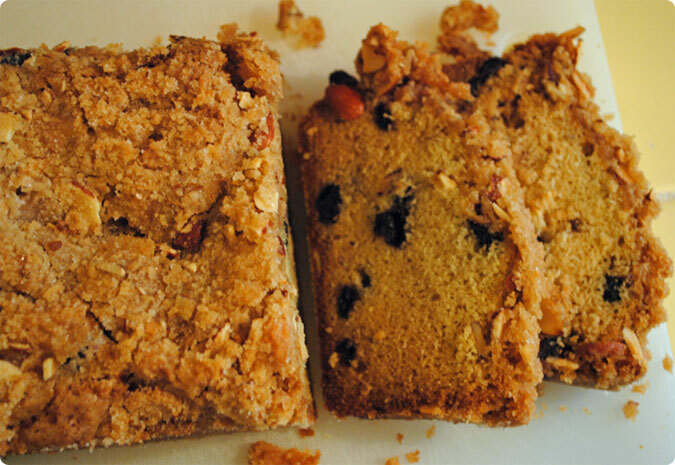 The blueberry almond bread recipe came from Joy the Baker. She used raspberries in her bread, and I might try that next time, or maybe a mix of berries. I used frozen blueberries that I’d thawed out and drained, and dried as much as I could on paper towels. I added a buttery almond streusel to the top of this bread that was so delicious, sweet and crunchy. It might have been my favorite part of the loaf. Mix together all ingredients except for almonds and butter. Cut butter into flour mixture with a pastry blender or two knives until the butter pieces are mostly the size of small pebbles with some larger pieces, then mix in the almonds. Refrigerate until ready to use. Preheat oven to 325°F. Grease and sugar a 9×5 loaf pan. In a large bowl, using an electric mixer, cream the butter, sugar and almond extract until light and fluffy, about 3 minutes. Beat in the eggs one at a time, beating well after each addition. Mix in the flour and sour cream. Fold in the crushed fruit and almond slivers. Spoon the batter into the prepared pan, then top with streusel. Bake in the center of the oven for 55 to 60 minutes, or until a cake tester inserted into the center comes out clean. Cool the bread in the pan for 20 minutes, then invert onto a wire rack, turn right side up and cool completely. They both sound amazing, but that beer bread looks incredible! Nice job on the challenge!